I’ve mentioned in the past that we love the winter months in Fethiye – the slower pace of life, clear, sunny days, stormy weather. There’s more of a ‘Ahhh, what shall we do today?’ feel about the winter months. However, we also know that this isn’t for everyone, so we were a bit curious about how our friends would react when they came out to Fethiye for New Year. These same friends spend their summer holiday in a horizontal position on a sunbed on Belcekiz Beach in Ölüdeniz. Fortunately for us – and for them – they absolutely loved it. They loved that Fethiye still functions as a normal, working town and that the seaside cafes and restaurants are still busy with people drinking çay and playing tavla (backgammon). But they also really enjoyed what we enjoy too – how some areas go to sleep for winter, becoming almost unrecognisable. They take on a completely different beauty. Before dropping our friends off at Dalaman Airport, we decided to stop off along the way for a farewell lunch. Göcek is the perfect place for this as it’s about half way between Fethiye and Dalaman and just so happens to be very pretty. It is also a perfect example of what I mentioned above. Göcek is all about boats. Luxury, private yachts and cruisers, gülets, stores selling boating supplies and clothing, shops advertising ‘free yacht service’ where food and drink supplies are dropped off to the customer’s boat. On the 2nd January however (the day our friends left) it was all about the natural beauty of Göcek. Moody skies, black sea. We’ve never seen the marina so empty of boats and it was lovely to be able to see the shape of the bay and the mountains in the distance. Compare these photos to the one I took last May when we did the Fethiye to Göcek boat trip. The top photo in this post is the same part of the marina as the second photo in the boat trip post. Around the side streets, construction and refurbishment is already in full flow as businesses begin to prepare for the 2011 summer season. Fortunately for us, there are a handful of cafes along the seafront that have stayed open. 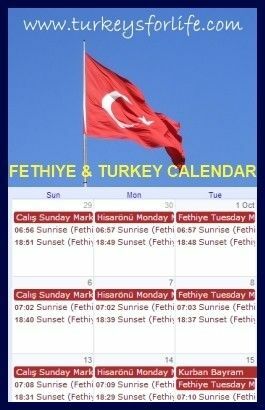 What a lovely entry to read about my beloved Fethiye and it’s surrounding areas – whilst trying get back into the swing of things after Christmas and New Year.